I don't know about where you are, but it is a stinkin' hot summer down here in the bottom half of Texas. We use window units in the double wide. Hang curtains in doorways so we only cool certain areas of the house throughout the day. Trying to be as economical as we can. And it's completely sucky interesting to walk into the living room at 7:00 am to discover it's already 86 degrees in there. Such is life in this part of the world. So, I cook very, very little. We focus on meals that are fresh, light and easy (and hopefully involving nothing that requires heat). One of our all-time favorites are green smoothies. At which point, several of you roll your eyes and say, "OMG, there she goes again, friggin freaky hippie freakity-freak!" Come on, now. Don't you remember - I don't eat things that taste like crap! And green smoothies don't taste like crap. I mean, I'm sure you could make one that does, but why would you? And green smoothies do, in fact, fill you up. It is such a mental thing with people that something in a glass is a "drink," and therefore cannot count as a meal. But if you threw that hamburger and fries into the blender? It would fill up a glass. We have these things for dinner much like we would have them for breakfast. I usually make two batches which allows some to have a second glass, if they want. I thought I'd give you a few ideas to ease you into the land of green smoothie goodness. "Green Smoothies for Whiney Babies," if you will. Throw it all in a blender. Blend the holy hey-diddle out of it. Several minutes, in a regular blender. Get it as smooth as possible. The reason I posted this recipe first is because it turns purple - NOT green. See the picture above? That's the pinkish color in the middle. I made another batch without the strawberries, and two big handfuls of spinach. That is the green part you see. My kids love the contrasting colors. Again - blend, blend, blend. If you feel like it is too thick for your taste, another fun trick is to go ahead and pour it halfway into a glass and then fill it up the rest of the way with a favorite nut milk (or soy). You can then use a straw to mix it up in the glass if you wish. It's almost the same concept as a "fruit on the bottom" yogurt. It's just makes it more fun and interesting. If the idea of having a green in your smoothie freaks you out, then take baby steps. One handful. Do it and try it. Do you already have a favorite smoothie recipe that you make? Throw in a handful of kale (the leafy part - pull it off of the stems, as those can get bitter). The smoothies I make are crazy delicious and we have yet to have kids not like the taste. Yet, you can ease your way into the appearance. Don't let the recipes on the green smoothie sites freak you out. BABY STEPS. Come on, whiney baby! Just one. This summer do at least ONE green smoothie. I double dog dare you! =) Just finished one for breakfast! I agree on meals that involve NO HEAT! I'd never thought to try pineapple in them. Mmmmm. We're pretty new to green smoothies, but my kids love them. I use yogurt in them a lot instead of milk too. I've made them for lunch a few times and they go really nicely with homemade bread too and if you use a bread maker it's quick and won't heat up your kitchen. We had a fruit smoothie for breakfast. :) I love green smoothies too. Smoothies are perfect in the Texas sauna. I love me some green smoothies! I think I'll go make me one for breakfast! I can never get the spinach completely blended in my blender. Do I need a new blender? Blend longer? Sucking up lots of spinach junks is just not appealing, even to me! Thank you for posting this. We get a produce box every week and I was trying to figure out what to do with our big leafy greens. I'd prefer to keep them raw so this is awesome! I started making green smoothies in a regular blender. Yes. Blend, blend, blend, blend and then blend some more. If all the blending causes it to lose some of its chill, you can throw in a few ice cubes or frozen strawberries once it is COMPLETELY blended and then give it another whirl. I first blend only almond milk (or whatever liquid you use) and the spinach first. For a couple of minutes, maybe three? Then I add all the other good stuff and blend away. No more spinach bits! Whenever I have bananas that are a bit too ripe, I peel them, break them in half, and freeze them to add to the smoothies. I add my daily flaxseed to my smoothie too. I have a "green monster" almost every morning for breakfast! Very yummy, very filling. If you've never had one, you need to try it! What can you use in place of bananas? Would Mango work? So far that's a safe one. Or how about pears? Those are the only two fresh fruits, other than citrus, that I am not allergic to. Oh, and I can do blueberries, but all other berries are out. So bummed. I hate these allergies. MRK - call them "ice cream shakes" or something fun like that. 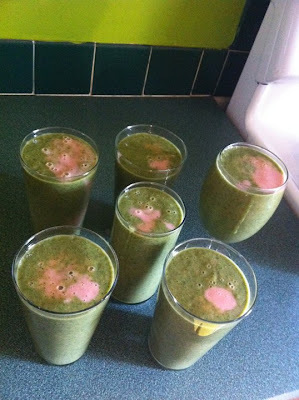 We have called them Hulk Smoothies or whatever else I could make up when we tried a new version. Makes it fun! Hannah, try whatever sounds good!! how funny. I just posted our smoothie recipe(s) on my blog! We have a source of raw milk and we make our own yogurt so I use one of those two things plus frozen bananas as the base. We have been drinking them EVERY day! I can't wait to try out these versions! I love the idea of using pineapple for sweetness - then I could cut the honey or sugar (don't love having those in it but it does need something sweet). And I never thought of doing two colors, but I have to make 2 blenderfulls anyways, so what a great idea! frozen banana, frozen mango, frozen pineapple (which is absolutely delicious), spinach, mint, spirulina (for added color and antioxidants), wheat germ, and water. So delicious and filling! I think mint is a really nice addition and gives things a nice, crisp summery flavor. I'm looking forward to trying the second recipe you mentioned. I need to get a juicer and juice it. Have you tried Kale chips!? We always enjoy smoothies, but I never realized before that dinner could come in a glass. Brilliant! This fits my general rule for "cooking dinner" - The recipe must have less than 5 ingredients and take less than 5 minutes to pull together. Both boys gave it Thumbs Up last night! Tried one today -- used half a cup of pineapple, half a cup of Fage Greek yogurt, some melon, banana, and the spinach. It was great! Great recipe! With some whey protein and some spirulina it makes the perfect post-workout food.